BY Experience presents Great Art On Screen. 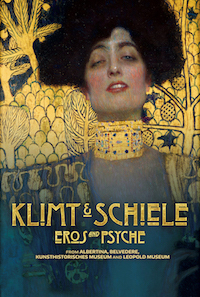 Klimt & Schiele: Eros and Psyche, recounts the start of the Vienna Secession, a magical art movement formed in the late 1890's for art, literature and music, in which new ideas are circulated, Freud discovers the drives of the psyche, and women begin to claim their independence. It was a movement that marked a new era outside the confines of academic tradition.? ?At the heart of Secession were artists Gustav Klimt and his protégé and dear friend Egon Schiele. This exhibition proves an in-depth examination fo images of extraordinary visual power: from the eroticism of Klimt's mosaic-like works, to the anguished and raw work of the young Schiele in his magnetic nudes and contorted figures against the backdrop of nocturnal Vienna, full of masked balls and dreams imbued with sexuality.